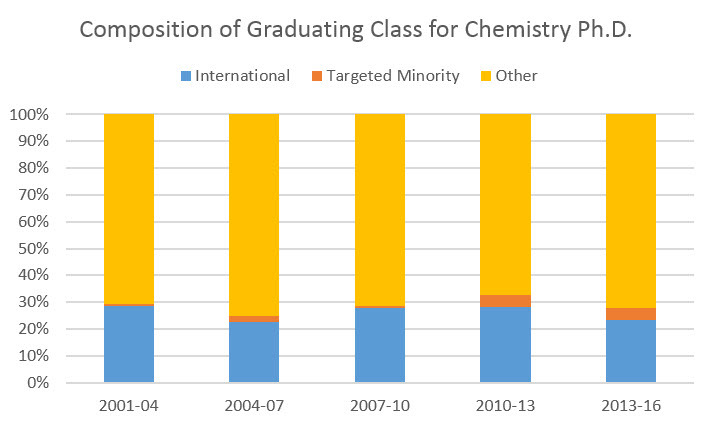 In 2009, the department made specific commitments to increase our graduate student diversity. In response, the department instituted several new programs including CHOPS and Catalyst. We have made significant progress towards our diversity goals and remain committed to further progress. 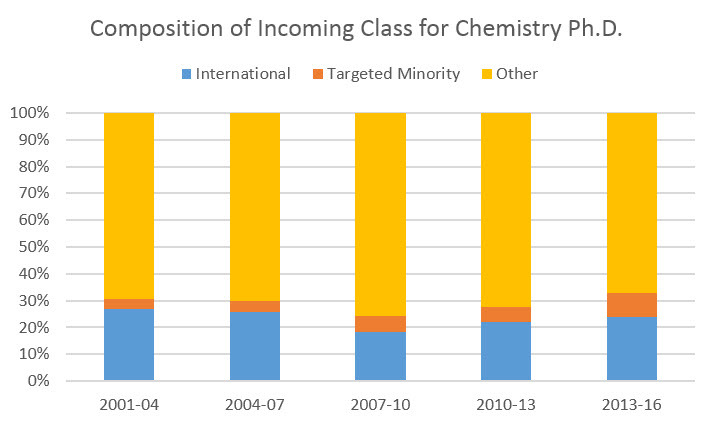 Below you find figures showing the increasing diversity of the UW-Madison Department of Chemistry over recent years. For these graphs, “targeted minority” means groups that are underrepresented in the STEM disciplines, including Hispanic or Latino, Black or African American, American Indian, and Alaska Natives. “Other” includes all U.S. students and permanent residents who are not from underrepresented groups. 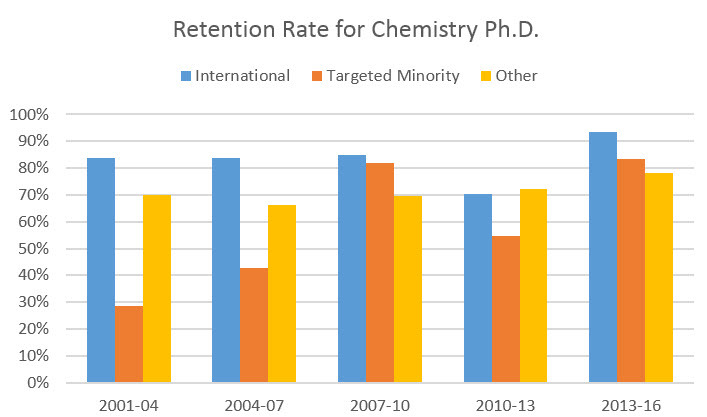 The left panel above shows a steady increase in the fraction of targeted minority students entering our Chemistry Ph.D. program. The right panel shows a significant increase in Ph.D.’s granted to students from underrepresented groups over the last six years. The left panel above shows that, over the last nine years, students from underrepresented groups are retained in our program at the same high levels as other domestic students. 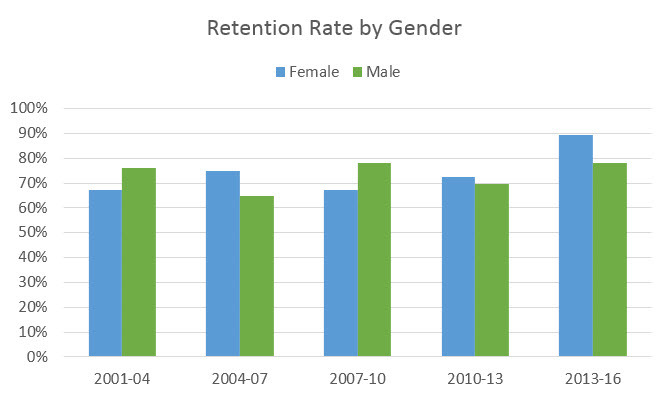 The right panel of shows excellent retention rates for both men and women in our graduate program. Data was provided by the Office of Academic Planning and Institutional Research at UW-Madison. Members of our community engage in many activities both within the department and across campus geared toward topics of diversity, climate, inclusion, and equity. The department also organizes several colloquia throughout the year that promote diversity in career paths, research interests, and life goals. Learn more about equity, diversity, and inclusion initiatives at UW-Madison. See a list of department and campus resources related to climate and diversity, maintained by the Department of Chemistry Climate and Diversity Committee.